This is an extra Sunday issue of this webcomic. Man: I'm excited! It's New Year's Day! Friends of mine, how is everybody? Voice: Achh! I feel sick! Voice: Why's the room spinning? Man: My friends are still recovering from New Year's Eve. They will be useless for a while. Let's see who else is up this cheery morning. Man: Hey news media! Any lessons from 2011? Voice: Don't buy a house you can't afford. Voice: Actually it's from 1933. We're not finding much new. Man: Hey financial sector! 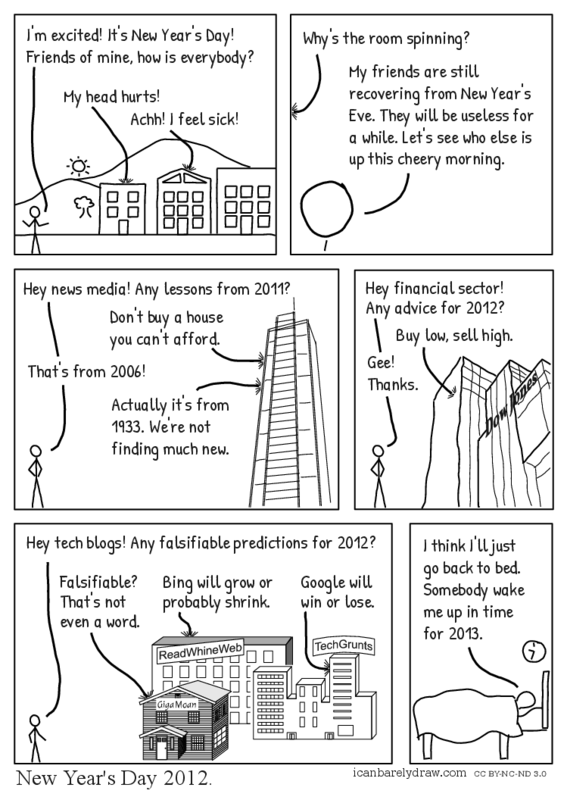 Any advice for 2012? Voice: Buy low, sell high. Man: Hey tech blogs! Any falsifiable predictions for 2012? Voice: Falsifiable? That's not even a word. Voice: Bing will grow or probably shrink. Voice: Google will win or lose. Man: I think I'll just go back to bed. Somebody wake me up in time for 2013. Title: New Year's Day 2012.